As the dog days of August grind on and the gardens seem to be steaming in the humid weather, we’re as grateful as ever for the various shade gardens we keep on the property. Set beneath the leafy canopies of mature trees or in the long shadows they cast, these lush, colorful oases provide shelter from the blistering sun, and there’s plenty to interest any gardener. 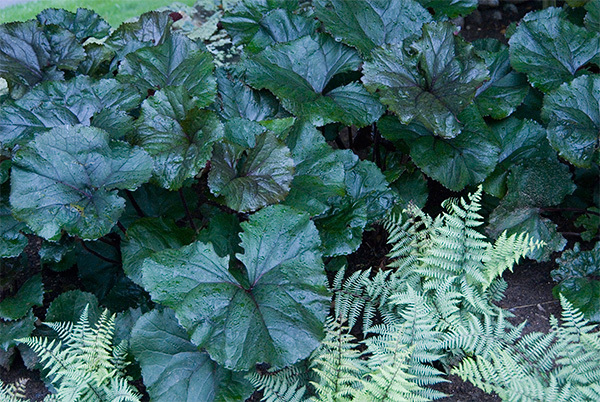 Shown in the photo above: We love the combination of Athyrium ‘Ghost’ with the dark purple iridescent leaves of Persian Shield (Strobilanthes dyerianus). Please note that the ferns need to be 2 years old to achieve the height necessary to pair them with the Persian Shield, which is planted each year as an annual in our part of the world. At this time of year, we’re especially pleased to show off the plantings in these gardens, proof positive that shady spots need not be dull. 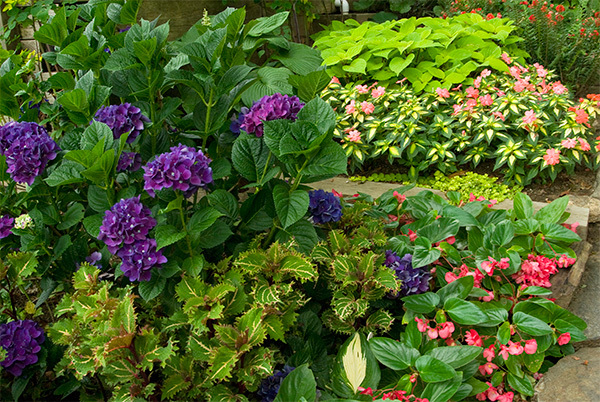 By mixing perennials, annuals and shrubs in these low-light areas, our head gardener Cheryl Whalen and her team mix colors, forms, foliage, and patterns to create a sense of lushness and beauty. Icy tones are especially cooling in the heat of summer. This fern (Athyrium ‘Ghost’) with frosted foliage looks marvelous alongside the dark, round leaves of Ligularia ‘Britt Marie Crawford.’. The photos below show a broad variety of shade garden combinations that Cheryl has created in various years. 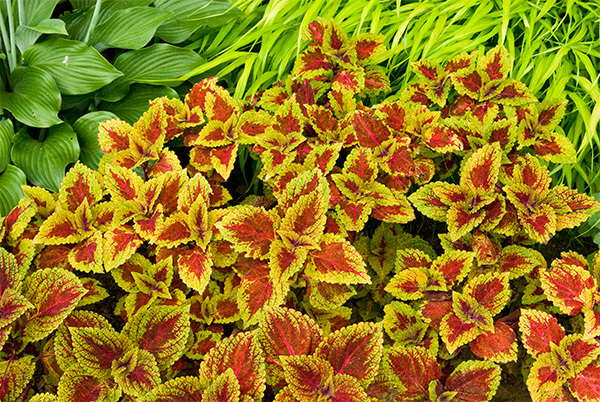 Some of the perennials or shrubs such as hydrangeas, hostas, hakonechloa grass, ligularia, rodgersia, astilbe, and ferns may stay in place, but annuals including fuchsia, impatiens, coleus, and caladiums, and smaller perennials such as heucheras may be changed out from year to year depending on what we’re trialing and what Cheryl finds appealing. Here’s what one shade garden looked like in early spring. 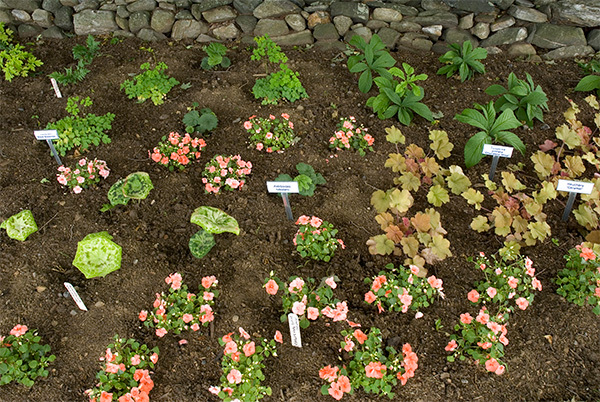 The leaves of Rodgersia, Astilboides tabularis, Podophyllum, Heuchera ‘Caramel’ and columbines are poking through the soil, and Cheryl and her staff have planted colorful Impatiens. As you retreat to the shady spots in your garden, keep in mind some of these combinations for next year. Hydrangea Color Fantasy(R) adds its large, deep purple Mophead blossoms to the shady color show. 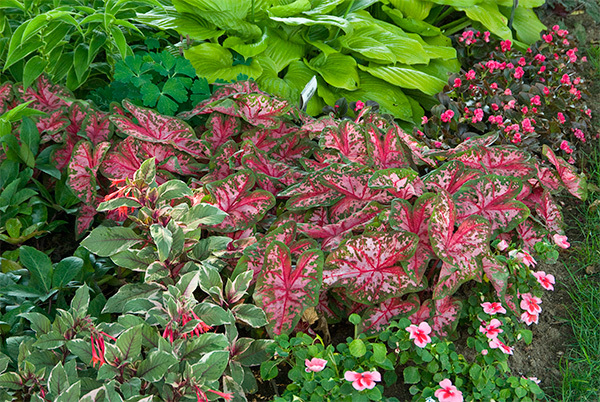 Its companions include two types of coleus, a variegated impatiens, and nonstop flowering Begonia Dragon Wing(R) Pink. 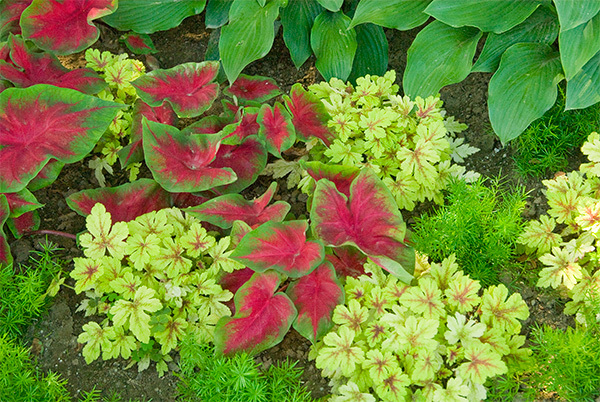 The pinkish-red leaves of Caladium ‘Florida Cardinal’ add a bright pop of color to shade gardens alongside chartreuse Heucherella ‘Alabama Sunrise,’ a green-leaved hosta, and the needle-like leaves of Asparagus Fern (Asparagus densiflorus ‘Sprengeri’).